Dr. Schenk's 3D House of Satellites: Two Months! Two months, Eight and half weeks, 58 days. It's a concept almost too difficult to grasp: we are on Pluto's doorstep. Just 9 years ago I witnessed the launch of New Horizons (the only launch I've ever witnessed in person; although I did some model rocket launches as a kid I don't think they count). And 85 years since Pluto was discovered, just weeks after the Great Stock Market Crash. Think of the monumental changes here on Earth since that time. How time flies. The idea that the first Pluto encounter will happen in just 2 months is very exciting. The encounter started in January when distant observations began, but for geologists like myself, the Pluto encounter will be a very short thing, about 6 days long. That is the period of Pluto's rotation (or the length of a Pluto "day"). It is the time over which we will see each side of Pluto at its best, including the moments of closet approach on July 14, when we see one side of Pluto (and is large moon Charon) at better than 250 meter resolution (and parts as good as 100 meters!). Us geology types need to see volcanoes, fractures, craters, and that requires resolutions of better than 10 kilometers, which we will likely start seeing during the final Pluto rotation begins on July 8. The largest craters or fracture systems may be visible before then. We have not and will not be idle on approach, however. Features on Pluto movie. New Horizons is already spotting features, including a possible polar cap and a bright spot near the equator. Bright spots often tend to be recently formed impact craters, say in the past 100 million years or less, but we will have to wait till July to know. We may even see linear features like the dark bands on Europa during our approach. The plucky probe is routinely monitoring the Pluto system and can start searching for unknown moons, having now observed all 5 of the known moons. If there are any rings, we could find out sometime in June or July. What will I be doing in July? Besides being in residence at the JHU Applied Physics Lab in Maryland for the encounter, I will also be helping lead the cartography effort, registering high-resolution images to the surface of Pluto and its large moon Charon to produce the first preliminary maps of these bodies. These maps will be updated as the data are slowly returned to Earth from great distance (the radio signal takes 4.4 hours to get back to Earth!) These maps will look a little bit like the map of Triton we made from Voyager 2 images acquired in 1989. There will be a north polar gap and one side will be kind of fuzzy, but who's complaining! 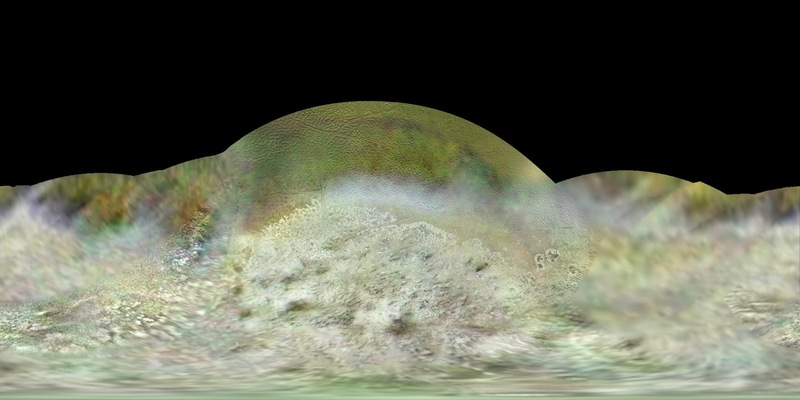 I will also be using stereo to map the surfaces of both bodies, and from that we plan to get the best topographic maps of the heights of things on Pluto and Charon! Voyager 2 map of Triton; a preview of the kind of global map we can expect for Pluto (and Charon), only better. Pluto/Charon science I'll be most interested in will be crater morphology. Craters can tell us about what is buried under the surface, how hot the interior has been, and other interesting things, which I'll try to blog on soon. After all, impact craters are the one geologic feature we can (almost) guarantee we will find on Pluto and Charon. I will also help those looking for volcanoes or tectonic structures. Most ice worlds also have some fault scarps and fractures, but until now we have mapped only icy bodies orbiting in close proximity to large planets, which can impose strong gravitational stresses on moon interiors. Pluto and Ceres both are the first examples of ice-rich worlds we have visited that orbit the Sun alone, uninfluenced by a large parent body. "Fascinating." Which brings me to Ceres. We have now completed the observation phase called RC3, "rotation characteristics 3," in which Dawn observed the entire surface of the dwarf planet from the north, the south and over the equator. One of those sequences has been released in movie form, allowing everyone to see many of things we have seen from RC3. I can't say too much about any of these yet, except that the team is pouring over the data, which has a pixel resolution of 1.25 kilometers. This is comparable to what Voyager saw during its tour of the icy moons back in the 1980s. The next mapping phases in June, August and November will bring us Galileo and Cassini class imaging at better than 400 meters resolution, and ultimately down to ~38 meters. A still from the recently released rotation movie of ice-rich Ceres. The complex and still enigmatic Bright Spots are at center. Faint arcuate troughs also cross the scene. These emanate from a large impact basin to the south. I'm still not sure what these features all mean. It recalls the Galileo and Cassini experience where we saw entirely new features when we got down to smaller than 1 kilometer resolutions. It was like we had never seen Europa, Ganymede, Enceladus, Dione or any of the other icy moons before! Much will become clearer when we get to lower altitude on Ceres. 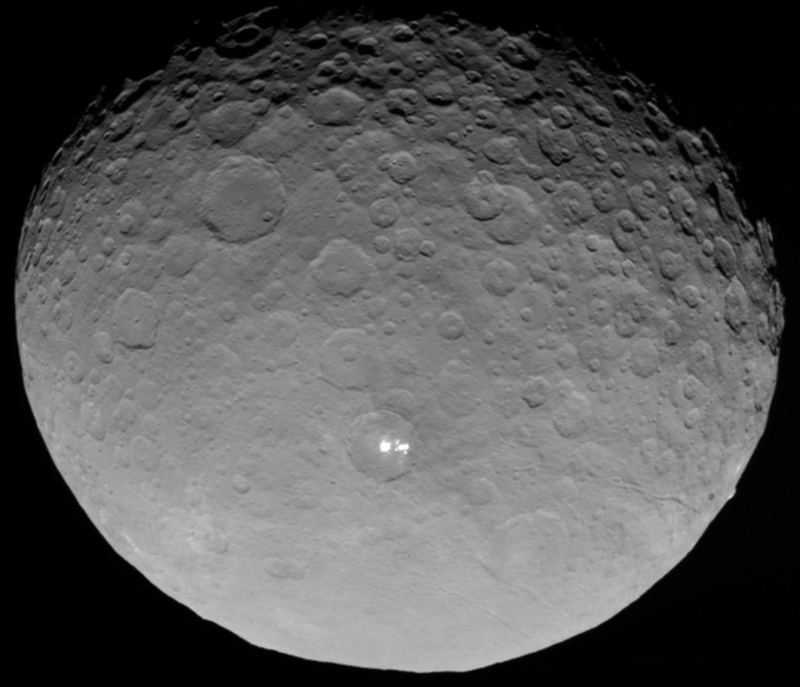 I am looking at crater morphologies on Ceres, measuring diameters, looking at ejecta, including some of the bright and dark ray patterns you can see in the rotation movie, and looking at pit craters, too. Right now we are mostly working to inventory what is on the surface, formulating hypotheses to test when the next data arrive in June. We are very busy! Pages from my Planetary Scrapbook, 1971-1980. There were so many Buffalo News newspaper clippings I had to overlap them. Which gets me to the end of today's rant. When time permits (which is scant these days) I monitor the buzz on forums such as Unmannedspaceflight, which is an open forum for those interested in the Solar System. Some have noted a reticence on some projects and science teams to be more forthcoming in data release or science discussion. There is some truth to that. Some flights are better than others (I won't name names), and it is something I can't change. Dawn is pretty darn good, and New Horizons will release all images in browse format, within 48 hours of acquisition, for example. I am part of the Mariner and Voyager generation, where the only outlet for new planetary information and images was the newspaper and the 3 networks' nightly news (which might have a 2 minute report on the day after encounter), followed some days later by the weekly news magazines of the time. That was it. I still have my newspaper clippings from those days. No blogs, twitter, websites, videos or anything. And a year later the data were archived for general use. The science teams have an obligation to themselves and the public. The first is to get the data in suitable format so that the data products that are released are of good quality and do not have incorrect orientations or colors (recalling the false blue skies from the first Viking lander image); and to avoid premature speculations that might be difficult to retract later on. It takes a few days to prepare good stuff. Patience young padawans . . . the data returned from these fantastic missions belongs to all of us, supported by the public through their taxes and part of the national trust. The mission and science teams are working hard to get the best products out for everyone to enjoy and to join in the analysis and speculations. These new worlds will be ours to enjoy all Summer!